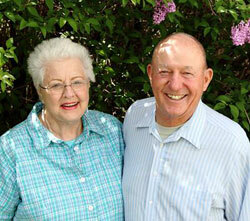 Jerry and Shirley Heckart understand giving is the currency of compassion and kindness. The hallmark of the couple’s 55-year marriage is their generosity of time and resources in caring for the disadvantaged. Of all the ministries that Jerry and Shirley have supported over the years, the one that has captured their hearts the most is Fathers in the Field. The Heckarts understand the importance of leaving a legacy. Although Jerry worked for the State of Wyoming for 27 years, his real passion was to help his church and community become a better place where God was glorified. He faithfully served as a deacon of his church for 32 years, was a volunteer fireman for 14 years, and served on the Lander City Council and as the mayor for eight years. Serving alongside him, Shirley taught Special Education at a facility caring for severely physically and mentally disadvantaged adults for 22 years. While there, she inaugurated the Senior Day program to help residents overcome daily challenges. After she retired from teaching, she doubled her volunteer time at a local Christian school serving as a teacher’s aide for the past 18 years. To make a tax-deductible gift to Fathers in the Field, click here.